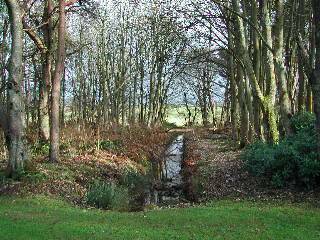 Mixed woodland on the south-east outskirts of Troon. Originally the home policies of Fullarton House, built in the mid-eighteenth century with a stable block added a few years later. The main house was demolished in 1966, now all that remains are two stone pillars at the entrance to the car park. The stable block has been converted into flats. The woodland forms two distinct sections, one tract lying to the north of the car park and one to the east, both serviced by a network of paths. The main surfaced path links the centre of the estate with Wilson Avenue to the north. Unsurfaced paths follow the perimeter of both north and east tracts. A number of rough tracks criss-cross through the woods. 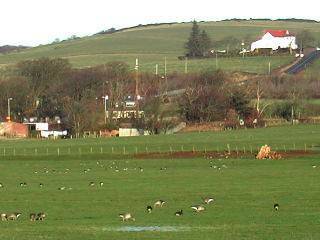 Drive past rugby club and park on site of Fullarton House, Troon (NS 45303). Note that the woods are very popular with walkers and dog-walkers. Disabled parking spaces at back left corner of car park. The perimeter path around the north sector, despite being rough and muddy at times, should be negotiable by wheelchair with care. The eastern sector is only accessible by wheelchair from the (sometimes busy) unclassified road passing the stable block. The rough tracks criss-crossing the woods are best avoided. Within 1km of National Cycle Route 7. Reasonably wide variety of common resident and migrant woodland birds including Great Spotted Woodpecker, Blackcap, Willow Warbler, Chiffchaff, Spotted Flycatcher and many others. Rich in bird song in spring. Also listen for Green Woodpecker. The fields lying to north towards Loans flood in winter. Good for greylag geese and grey heron. Ducks and roosting waders can also be present at high tide. Worth checking through the geese for other varieties. Also large flocks of winter thrushes are sometimes feeding on nearby stubble fields or set-aside.